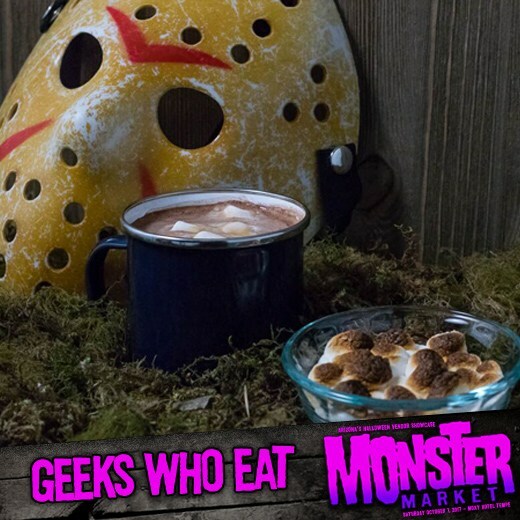 Monster Market and Geeks Who Eat are excited to announce a cool workshop event at the inaugural Monster Market event, hitting the Moxy Tempe on Saturday October 7th. Are you planning on throwing a killer Halloween party? Not sure what horror inspired spread might be delicious but also look amazing? Have no fear, because we’re hosting a fantasticly freaky workshop to teach you how to make some spooktacular looking ‘horror’ d’oeuvres to make your party or holiday a slashing success! Looking for ghoulish grub ideas for Halloween? Our Monster Market demo will feature an exclusive recipe based on the movie The Lost Boys, which will be showing the evening of the event! Not only that, but we will be sharing some tips on throwing the perfect themed Horror Movie party or Halloween get together. Having worked both locally and nationally to create pop culture inspired recipes to promote releases of such scary fare as Annabelle: Creation, Get Out, IT, and many more, so we definitely have some horror cred! Monster Market is not just a craft marketplace or convention, but rather a celebration of spooky culture. From vintage Halloween, to rockabilly, goth, horror and everywhere in between. We like seeing the original, imaginary, and fantastical; and we find things that go bump in the night tend to make for amazing artistic inspiration. From art, to crafts, jewelry, clothing and collectibles, Monster Market aims to showcase the independent creator and artisan working with a creative and ooky bent. Monster Market was started by creators and vendors who are looking for something different in an event. It’s geared at showcasing creators and making them and their work the stars of our event. Monster Market is a juried marketplace, looking for diversity and originality and those whose work is showcased on our floor will be showcased as the stars of our event. It is looking to showcase the best and most creative spooky influenced voices in the Valley.